BRATTLEBORO, Vermont—Acting on their conviction that governments, regulatory agencies, and corporations fail to honor the public trust, nine women of the Shut It Down Affinity Group went to Entergy Corporation headquarters on Old Ferry Road January 15 to demand the immediate shut down of Entergy’s 42-year-old Vermont Yankee nuclear power plant in Vernon. 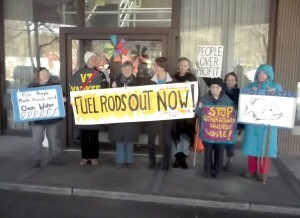 Brattleboro police arrested the women when they refused to move from the main headquarters door when Entergy officials ignored their demands. Lieutenant Jeremy Evans led the police detachment. The women were booked on site and released pending charges and a court date. In 2013, Entergy scheduled closure of the nuclear plant in December 2014. Vermont’s Governor Peter Shumlin recently announced a deal that will require Entergy to finance and follow through on decommissioning the plant without leaving radioactive materials on site for decades as the corporation first proposed. “Greed is the only reason not to close Vermont Yankee now,” said Hattie Nestel of Athol, one of the Shut It Downers. “There has been a persistent false belief that the nuclear fuel rods must cool before the plant shuts down, but that is wrong. It’s the other way around. The plant shuts down, and the fuel rods cool. 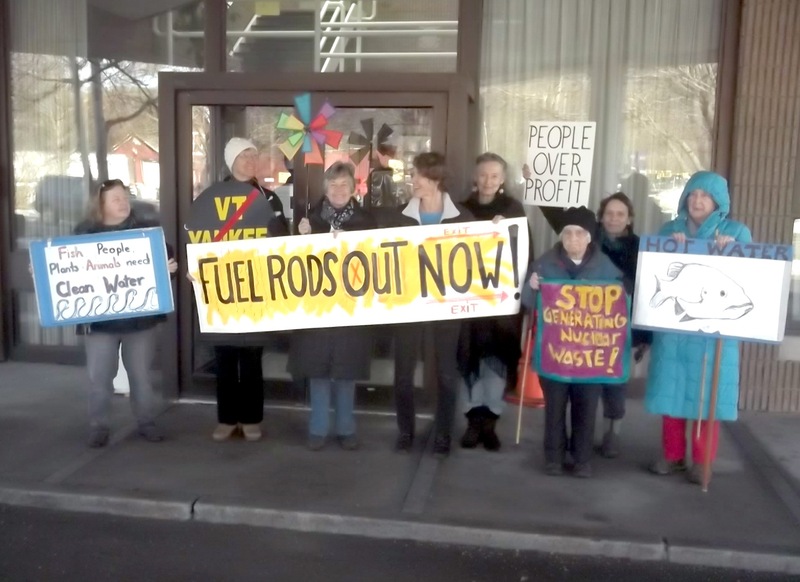 The women demanded immediate closure of Vermont Yankee, immediate removal of fuel rods that have been in the fuel pool for more than five years, hardened on-site storage, and using the cooling towers as intended. Arrested were, from Vermont, Linda Pon Owen, 74, of Brattleboro and Ulrike von Moltke, 69, of Sharon and, all from Massachusetts, Nestel, 74, of Athol; Priscilla Lynch, 62, of Conway; Anneke Corbett, 71, of Florence, and, all from Northampton, Frances Crowe, 94; Nancy G. B. First, 84; Connie Harvard, 65; Susan Lantz, 73. Since 2005, the Shut It Down Affinity Group has done civil resistance more than 30 times at the Vermont Yankee nuclear power plant in Vernon or at Entergy headquarters in Brattleboro. Each time, Shut It Downers insisted upon the immediate closure of the nuclear plant. Most often, the Vermont state’s attorney fails to press charges against the women arrested. In 2012, six Shut It Downers were convicted in Windham County Superior Court for their August, 2011 presence at the Vernon power plant. They refused to pay fines totaling more than $3,000, but the antinuclear community spontaneously raised the money to pay their fines.